Francisco Arguelles married Bridgett McNerney (1830-1917). Children: Augustine Arguelles (1858-1888) m. Dudley H. Lang (1856-1885); Mary Arguelles (1860-1926); Francis Arguelles (b. 1861); Bridgett Arguelles (1863-1877); Joseph P. Arguelles (1865-1944) m. Louise Eva Bellman (1867-1958); Jane Arguelles (b. 1869); John Arguelles (1870-1892) m. Alphonsine Roux m. Julius S. Sablich; Rose Ida Arguelles (1874-1941) m. Andrew J. Whelan (1868-1933). Augustine Arguelles(1858-1888) was born in Biloxi, Mississippi. She married Dudley Hubbard Lang (1856-1885) April 28, 1880 at Nativity B.V.M. Catholic Church in Biloxi, Mississippi. 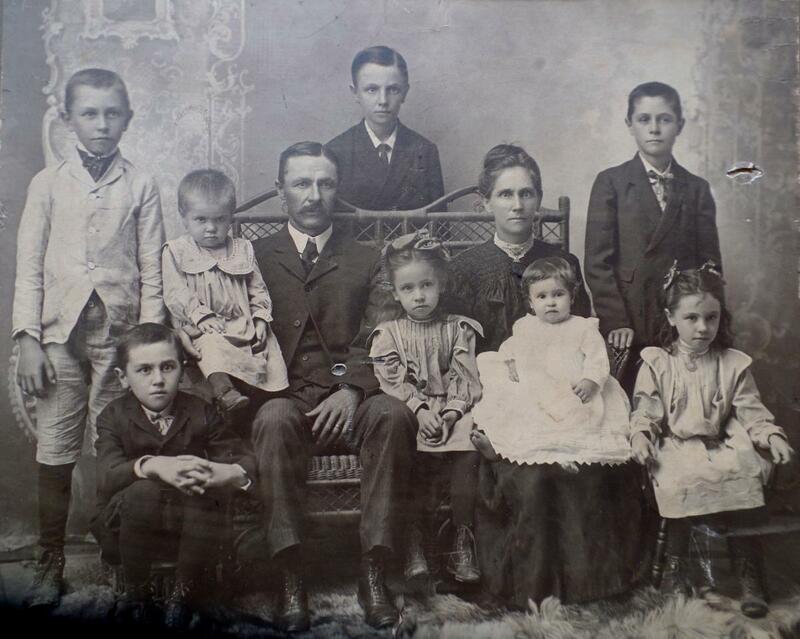 Their children were: Robert D. Lang (1881-1885); Nettie Eugenie Lang (1882-1971) m. Charles M. Wilkes (1880-1946); and Warren Joseph Lang (1884-1977) m. Katherine Hecht (1885-1978). 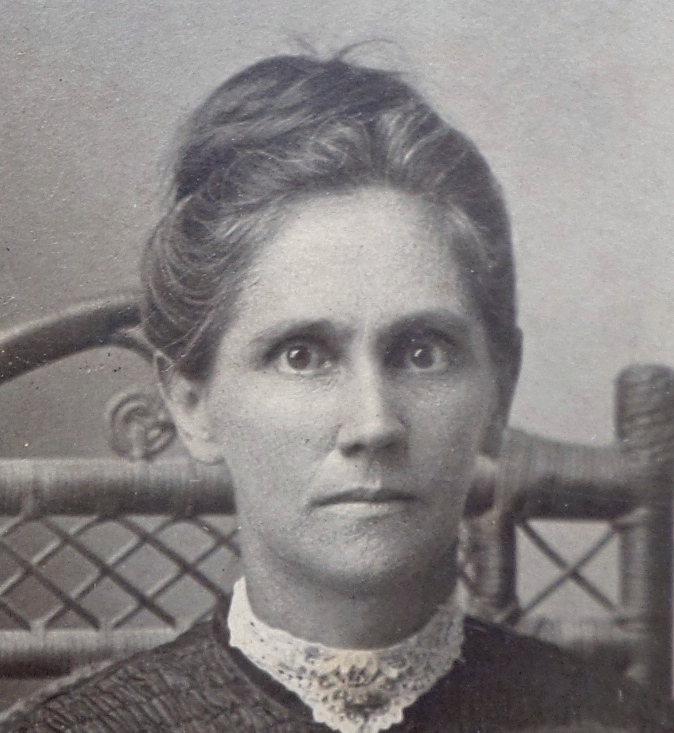 Mary Arguelles (1859-1926) was born at Biloxi, Mississippi on September 24, 1859. Francis Arguelles was born October 11, 1861. [L-R standing: Albert Arguelles (1892-1943); Warren Arguelles (1893-1973); and Frank Charles Arguelles (1894-1943); L-R seated: George H. Arguelles (1896-1934); Lillian Arguelles (1902-2000); Joseph P. Arguelles (1866-1944); Florence Arguelles (1899-1979); Louise Eva Bellman Arguelles (1867-1958); Bernadine Arguelles (1904-1989); and Ethel "Tina" Arguelles (1897-1938). Courtesy of Mike Arguelles. 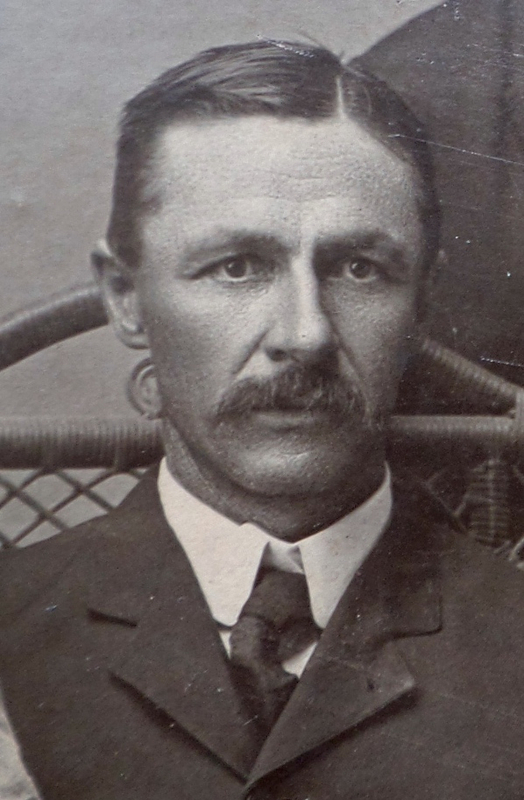 Joseph Peter Arguelles (1865-1944) was born January 25, 1866. He married Louise ‘Lou’ Eva Bellman (1867-1958), the daughter of Charles W. Bellman (1841-1885), a native of Biloxi, Mississippi and Almina Eagan (1851- 1881), a native of Hanover, Germany, on February 4, 1891 at St. Alphonsus Catholic Church in Ocean Springs, Mississippi. They were the parents eleven children of which nine were living when they celebrated their Golden Wedding Anniversary in February 1941 : Warren P. Arguelles (1891-1972) m. Fay Husley (1896-1984); Albert J. Arguelles (1892-1943) m. Elenore Frederick; Francis 'Frank' Charles Arguelles (1894-1943) m. Alice Rayburn (1898-1969); George H. Arguelles (1896-1934) m. Winnie C. Morris (1900-1980) m. Frederick D. O’Brien (1895-1958); Ethel A. Arguelles (1897-1938); Florence T. Arguelles (1899-1979); Lillian M. Arguelles (1902-2000); Bernadine W. Arguelles (1904-1989); Donald W. Arguelles (1906-1969) m. Margaret Reta Webster, Maisie Olivia Kelly King (1911-1986) m. Hugh E. Kirkland (1912-1992) and Abbie I. Anderson (1904-2002); Cecile A. Arguelles (1908-1994) m. George Pavlov (1910-1963); and Louise Arguelles (1910-1983). Warren P. Arguelles expired on August 1, 1972. Francis Charles Arguelles (1894-1943) was born June 26, 1894. He married Alice Rayburn (1898-1969), a native of New Orleans. Children: Douglas J. Arguelles (1917-1921); Lytle Arguelles; Frank C. ‘Mullett’ Arguelles Jr. (1923-2003); Rayburn Arguelles; Melonie “Betty’ Arguelles (1928-1975) m. Joseph Marine Rosetti (1927-2007) and John L. King. Alice Rayburn Arguelles, widow of Frank C. Arguelles of Biloxi, who was burned in an accident on June 4, 1969, died Friday night, June 1969, at Howard Memorial Hospital in Biloxi where she had been a patient since the accident. Mrs. Arguelles was 71 years of age. She was burned in an explosion at 3921 Atkinson Road, the residence of Frank ‘Mullet ‘ C. Arguelles Jr., her son. Alice was severely injured when she spilled some of the contents of the bucket of gasoline that she was carrying and it was ignited and exploded when contacting the water heater in her son’s home. George Henry Arguelles (1896-1934) was born June 30, 1896. He married Winnie C. Morris in Harrison County, Mississippi on April 2, 1918. Children: Joseph Arguelles, John ‘Jack’ R. Arguelles m. Dorothy Cobb; Ivon Anthony Arguelles (1925-2005) m. Lou Ella McMath (1928-1992); and Morris Charles Arguelles (2005) m. Mary Louise Lesso (19-2013). Florence Theresa Arguelles (1891-1979) was born June 10, 1899. Johanna and Lars Peter Eskald were the parents of two children: Robert P. Eskald (1902-1995) m. Ethel E. Jones (1906-1975) and Dorothy B. Eskald (1908-2000). Rose Arguelles and Andrew J. Whelan had two other sons: Andrew J. Whelan Jr. (1904-1980) m. Bernice Kettenring (1919- 1967) and Daniel J. Whelan (1906-1969) m. Beatrice Muldoon (1917-1995). The Biloxi Herald,“Death of Mrs. Lang”, December 1, 1888. The Daily Herald,“City News [Eskald-Arguelles]”, October 24, 1901. The Daily Herald,“Arguelles child [Joseph Douglas Arguelles] died this morning”, September 21, 1921. The Daily Herald,“School Principal [Ethel Arguelles]dies at Biloxi”, July 28, 1938. The Daily Herald,“Arguelles to have Golden Anniversary”, February 2, 1941. The Daily Herald,“Albert J. Arguelles dies”, December 17, 1943. 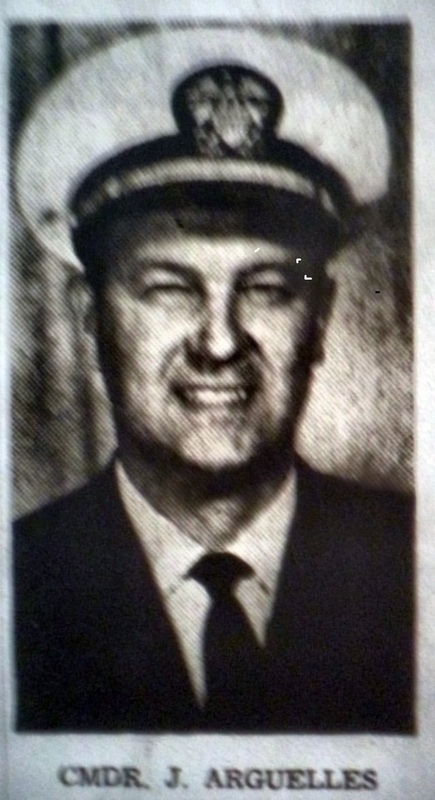 The Daily Herald,“[John R.] Arguelles promoted to Commander [USN]”, July 16, 1962. The Daily Herald,“Burns fatal to Biloxian”, June 19, 1969. The Daily Herald,“Warren Arguelles”, August 13, 1972. The Daily Picayune,“Father [James F.] Whelan ordained”, June 12, 1908. The New Orleans Item, “Spirit of play fatal to priest [Father James F. Whelan]”, June 27, 1919. The Press-Register [Mobile], “Margie Arguelles-St. Martin woman dies in wreck”, May 23, 2010. The Sun Herald,“Peter Eskald”, September 2, 1995. The Sun Herald,“Abbie I. Arguelles”, May 21, 2002, p. A5. The Sun Herald,“Frank ‘Mullet’ Arguelles”, May 15, 2003, p. A7. The Sun Herald,“Rayburn ‘Pete’ Arguelles”, June 3, 2004. The Sun Herald,“Mary Louise [Lesso]Arguelles”, June 9, 2013. The Times-Picayune,“[Andrew Joseph]Whelan”, March 8, 1933. The Times-Picayune,“[Rose Arguelles] Whelan”, February 4, 1941. The Times-Picayune,“Rites planned for Father [James F.] Whelan”, December 17, 1968. The Times-Picayune,“Whelan”, December 17, 1968.